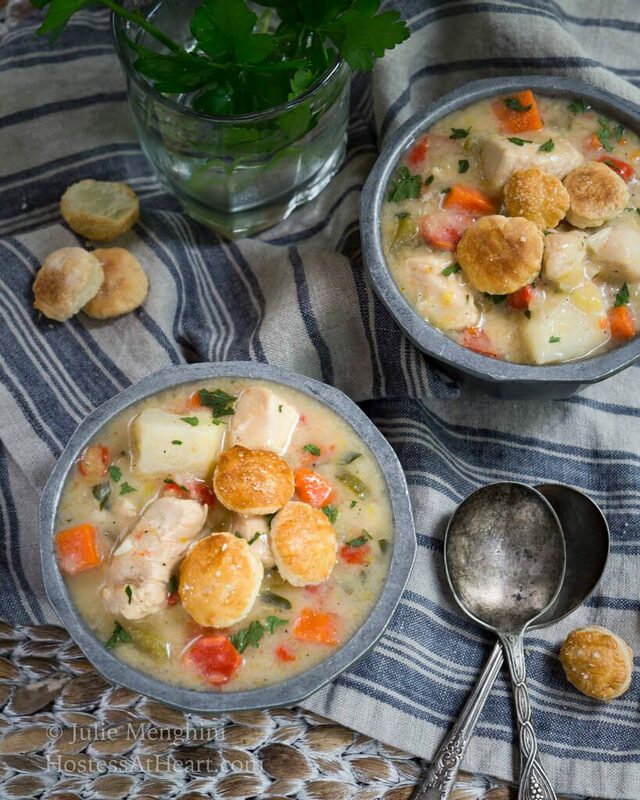 This Healthier Chicken Pot Pie Soup is a delicious and creamy recipe. The only thing missing is all of the extra fat, sodium and calories. When I was a child I could eat one of those frozen pot pies every day. 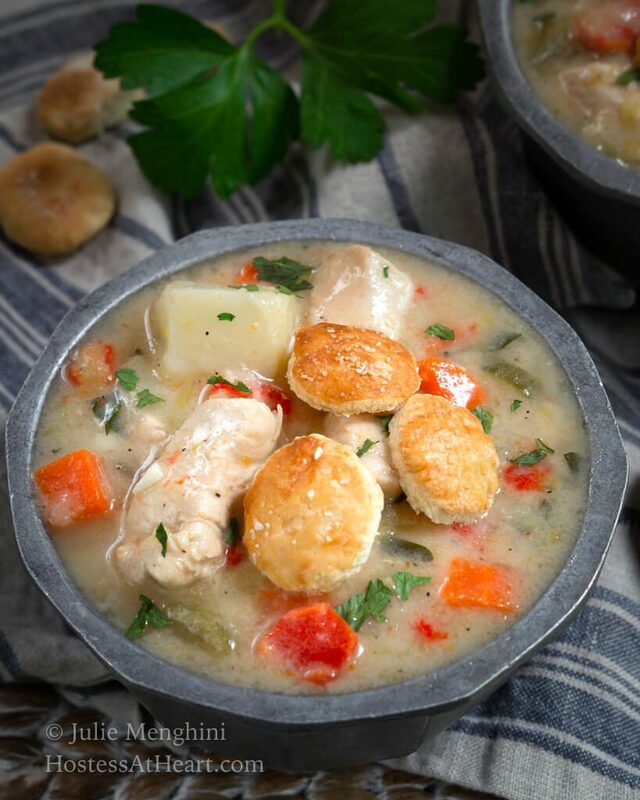 This Healthier Chicken Pot Pie Soup tastes better than those little pies that were actually more crust than that delicious filling. Once I was on my own, those pot pies were budget-friendly and easy to pop in the oven at the end of the day. It wasn’t until I had a family of my own that I started reading the nutritional labels. By then I was buying tastier versions than what we had available when I was a child. They were tastier because they were larger and their flaky crusts tasted like butter. The 630 calories were a sad shock but what really was the shocker was almost 1100 grams of sodium! That little box held more than just a little pie. It was holding a future heart attack! That was the last commercial pot pie that I’ve ever eaten. Sad indeed. Not long ago, the weather was cool and I had a craving for those pies. I’ve made my own pot pies in the past but I was more in the mood for the filling than the pie. The result is this soup. It is so creamy and delicious without all of the fat, sodium and calories. Instead of the buttery crust, I stamped out some little puff pastry bites. A handful of oyster crackers would work too or in my case, I didn’t think it needed either. 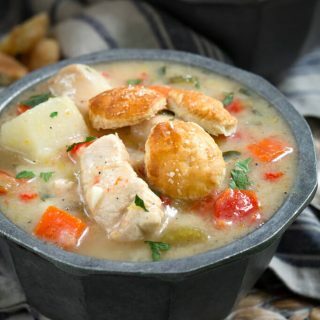 This Healthier Chicken Pot Pie Soup is a delicious and creamy recipe. The only thing missing is all of the extra fat, sodium, and calories. Preheat the oven to 400°F if you are making the puff pastry bites. In a 7 quart dutch oven or stock pot, add butter and olive oil. heat until butter is melted. Add leek, celery, carrots, and red pepper. Saute for 5 minutes. Add garlic and cook an additional 2 minutes. Remove the vegetables to a bowl. If needed, add additional olive oil to the dutch oven. Add cubed chicken and cook until all surfaces are sealed. Add the vegetables back into the pot with the chicken. Add the potatoes. Cover the ingredients with chicken broth. You can add additional water if the chicken broth doesn't cover all of the ingredients. Add Herbs de Provence. Combine evaporated milk with arrowroot powder in a small bowl or cup. Mix until combined. Stir into the soup. Soup will thicken as it cooks. Add salt and pepper as needed. Add parsley right before serving. Top with puff pastry bites or crackers if desired. Store leftovers in the refrigerator for a week or freeze for up to 6 months. Roll out puff pastry and cut into small circles. Place on an oiled baking sheet. Brush with whipped egg and sprinkle with salt. Bake 10 to 20 minutes or until browned. When I make soup I always make a lot of it. I freeze it in individual servings which make the perfect meal when the mood strikes or when we don’t have the time to cook. 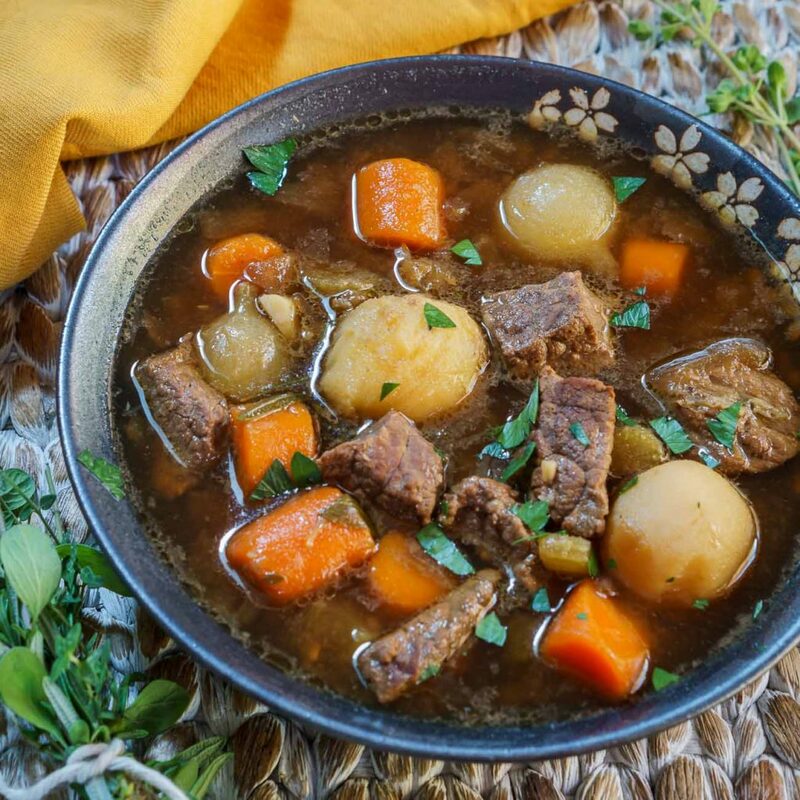 We love soup year around and here are a few of our favorites! Chicken Pot Pie is such a classic comfort food recipe! 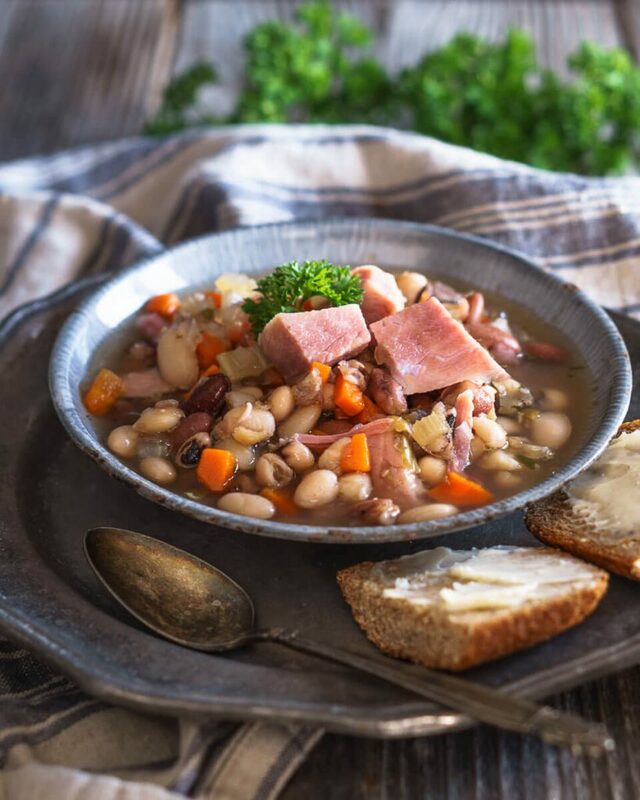 Love this lighter version as a soup! Thank you, Tisha! We loved the way this one come out and I loved how easy it is. Love this soup recipe. 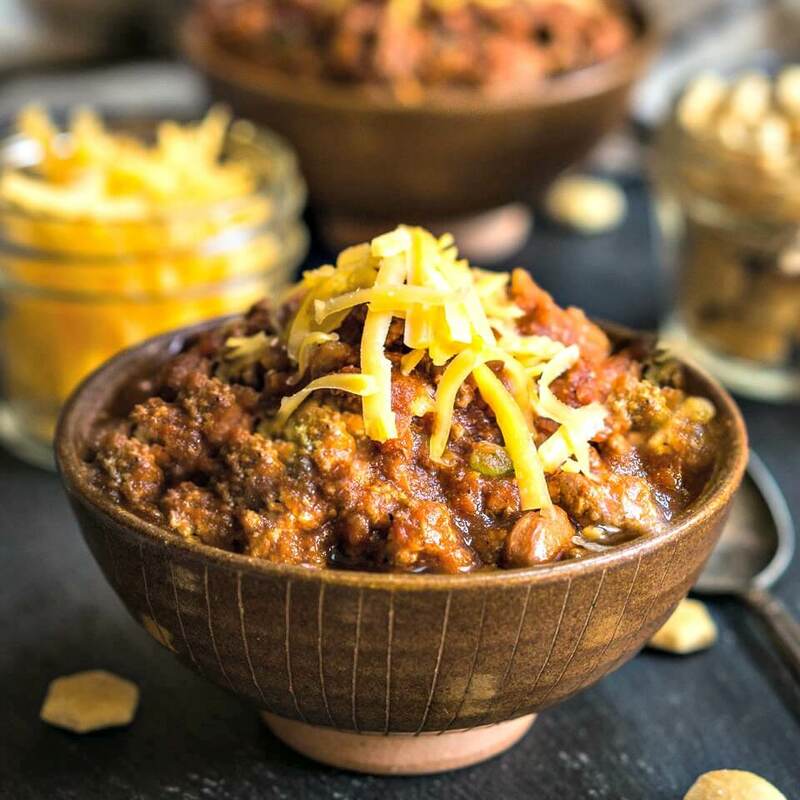 So comforting and easy to make! You have read my mind! I love chicken pot pie soup but feel so full after I eat it! Thank you for a healthier version so I can eat more without the guilt! Thanks! We are definitely on the same page! 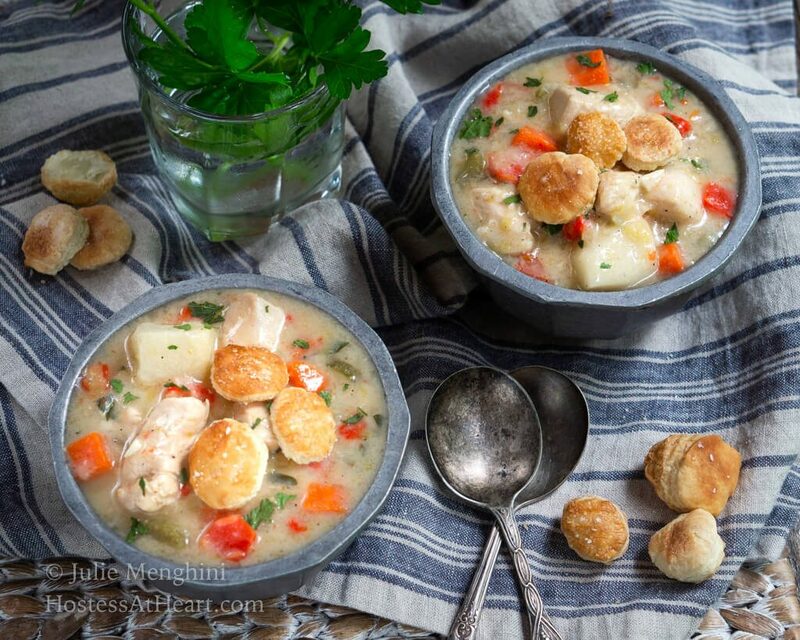 I love the idea of combining chicken pot pie and soup! It sounds so amazing! Thank you, Madi! It was a great way to make a larger batch for leftovers too! Those little puff crackers are just enough to make you feel like you are really indulging. Love the flavor of Herbs de Provence. Perfect in this dish! Thank you, Sandra! John loved those little puff crackers and they were fun to make. I remember eating those frozen pot pies too. They were one of my favorite dinners, lol! This soup sounds delicious and like total comfort food. Can’t wait to try it! I think it’s so funny how food invokes such memories. We loved this version. Thank you, Amy! This soup is fantastic, we loved all the flavors and no one noticed it was “healthier”!! Thank you Deb! We really loved it too! Pot pie is one of my favorite comfort foods! And I love these little puff pastry pies on top! Thank you, Debi! I was lucky to get a few for the soup. John was eating them by the handfuls. Chicken pot pie sounds so delicious. Its perfect for cold, winter nights. Thank you, Rini! It’s a great comfort soup without the guilt. I’m all for healthier meals and your soup wins the day. Thank you Karen! I love those foods that don’t taste like I’m trying to be healthy LOL! 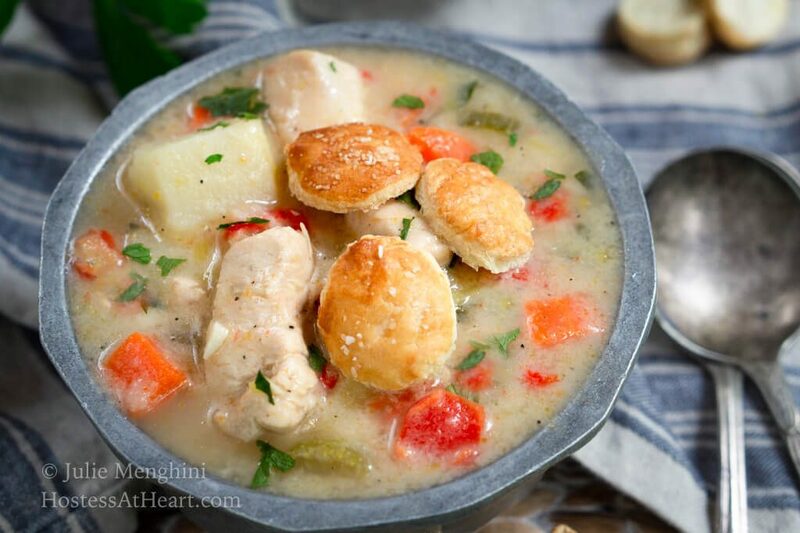 Chicken pot pie is one of my favorite comfort foods; I love that you turned it into soup! This sounds AWESOME! Thank you Kelsie! So much easier and figure friendly. I love pot pies as much as you, but agree the calories are killer. I like your healthier version ,and those puff pastry crackers are awesome! Thank you, Lily! John was eating those little crackers by the handful. He thought I did something special. I love when that happens. Enjoy your day! Those little pies are kind of horrifying! I picked up a couple one night after telling my son about them just so we could try them – I think there’s like 3 tablespoons of filling in them and they were not like the ones I remembered – but I was a kid. What did I know lol! it was always a treat when the folks had a night out and our sitter heated up those pies for dinner. Anyway, your healthier ones sound delish! Thank you! I think that’s the closest we came to fast food as a child so hey that’s reason enough to love them right? Enjoy your day! Thank you Nancy! We loved it and I love having a few servings in the freezer for another day. What a brilliant idea! I love the little knobs of pastry crust on top, too. 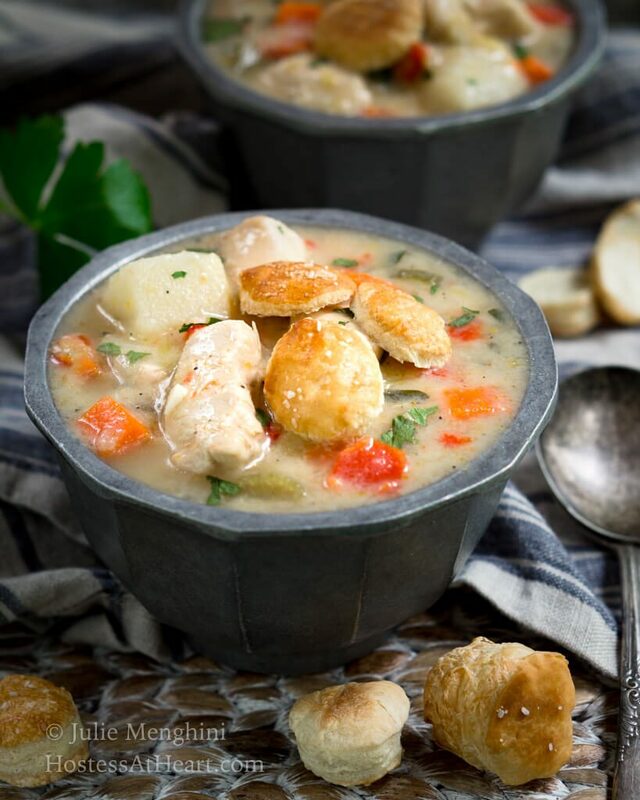 I’ve actually never been tempted to make a chicken pot pie, but I’d make this soup!!! Thank you! I used to just love those pies Mimi! They’re just comfort food that bring back memories. Something a lot of my food does LOL!